This ministry is open to all who desire to worship in a faith community where all are welcome to be WHOLE. The goal is to bring members of all walks of life to work together to address the body, mind and spirit of the community as a whole. This ministry welcomes engaged couples into the family-life dimensions of the parish while assisting them in their relational and spiritual growth as a couple. Volunteers can serve as mentor couples, pre-Cana presenters and hospitality hosts. Parents of Young Children: F3-Family, Faith, Fun. This ministry strengthens young families with children ages 0-5 providing resources, community and activities such as a family Mass and potluck dinner, playground outings, story time and ice cream socials. This is the process by which adults become members of the Catholic Church. They are introduced to Church doctrine, life, worship and service. 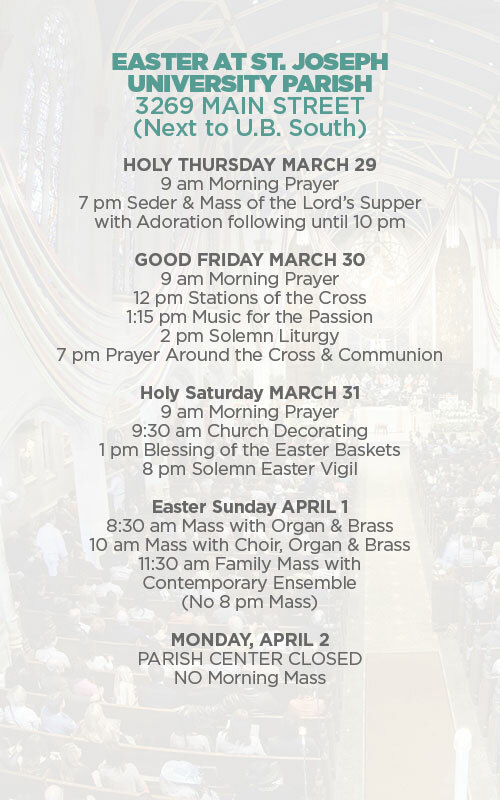 This small community meets weekly from Fall until Spring and celebrates the Sacraments of Initiation at the Easter Vigil. Parishioners are invited to become members of the team to share their faith, offer hospitality and provide personal support. Our mission is to provide rosaries for anyone in the parish at no cost. This ministry meets once a month at two separate times to allow flexibility of members when we create rosaries and pray for one another and the parish. You may also gather supplies to work on your own at home. This ministry meets the distinct needs of young adults, single, married, with children or without, by providing social and service events. Planning committee meets monthly. This group is a welcoming group for those who are looking to become more integrated into St. Joseph University Parish as well as meet and get to know fellow parishioners. This group consists of middle aged single or married, male or female individuals interested in monthly social, community and parish activities. Join us for a variety of spiritual and social activities throughout the year including speakers, presentations, outings and more. Our parish school has been educating children since 1850. Classes begin with Pre-K4 and go up to Grade 8. We welcome volunteers and their specialty in the field of education. Some areas for volunteer service include: library, music, art, games, recess, tutoring, storytelling, coaching, day care, etc. All volunteers must participate in the Diocesan Protecting God’s Children program. You can register with the parish by attending one of our upcoming New Parishioner Welcome Evenings.